It’s a never ending battle to find games that are perfect for a quick game night after a long day at work. So many games require a lot of setup, have tons of rules to learn, or are in other ways too complex to deal with on a weeknight. On the other hand, you don’t want something that’s so easy that it’s pointless to play. It’s tough to find a balance between “quick and easy” and stimulating. That’s why I’m always intrigued when a simple, two-player only game crosses my radar. Is this going to be something we can play on weeknights when we don’t have a lot of time or energy to set up a huge game or memorize a ton of rules? Or is it going to be yet another case of getting my hopes up only to find that it’s more complicated than it looks, drags on too long, or is just so simple as to be ridiculous? 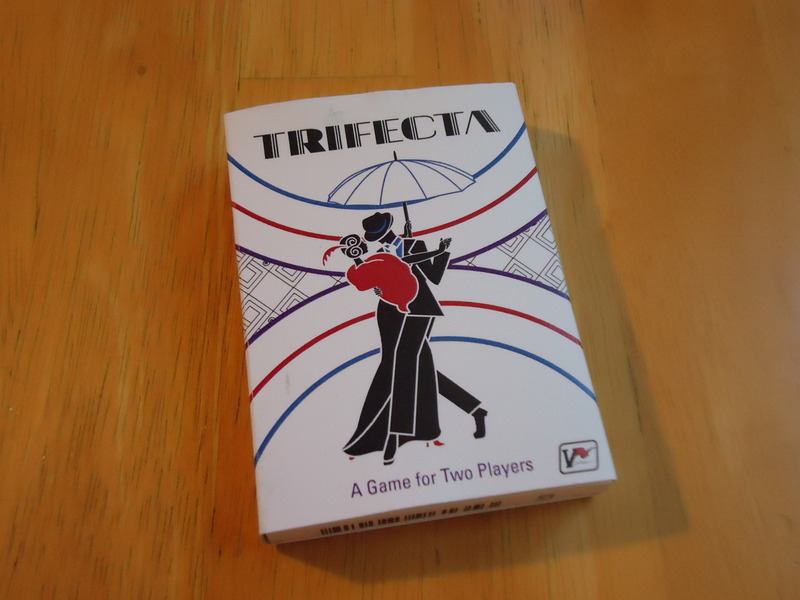 Trifecta looked to be a promising entry in my “two player weeknight game collection.” But was it? Trifecta is a simple trick-taking game that, in some ways, compares to that old standby of two-player recommendations, Battle Line. Two players face off over a table full of cards, and try to create optimal combinations for themselves while keeping their opponent from scoring. The tableau consists of a Plus, Minus, and Suit card in a vertical line in the center of the table. 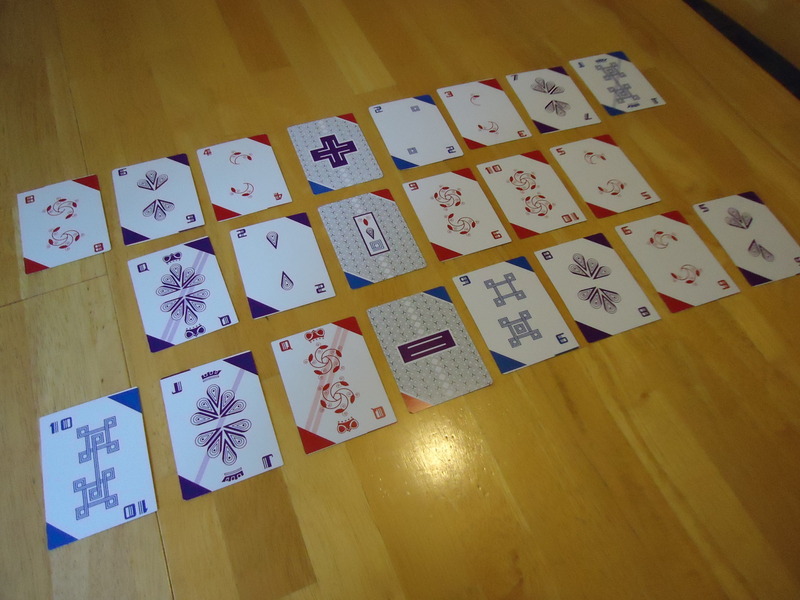 Each player controls one side of this line and the three horizontal rows that are formed by the central cards. Each player begins the game with two cards. Add a card to a row in your player area. Add a card to one of your opponents’ rows. The cards in the center of the table determine how each row behaves. 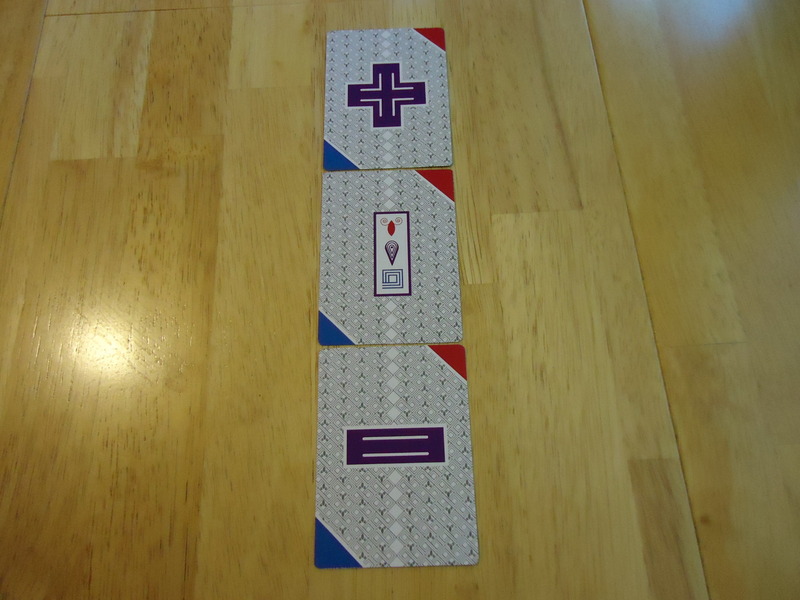 The Plus Symbol: Each card played on this row must be of equal or higher rank than the one before it. The Minus Symbol: Each card played on this row must be of equal or lower rank than the one before it. 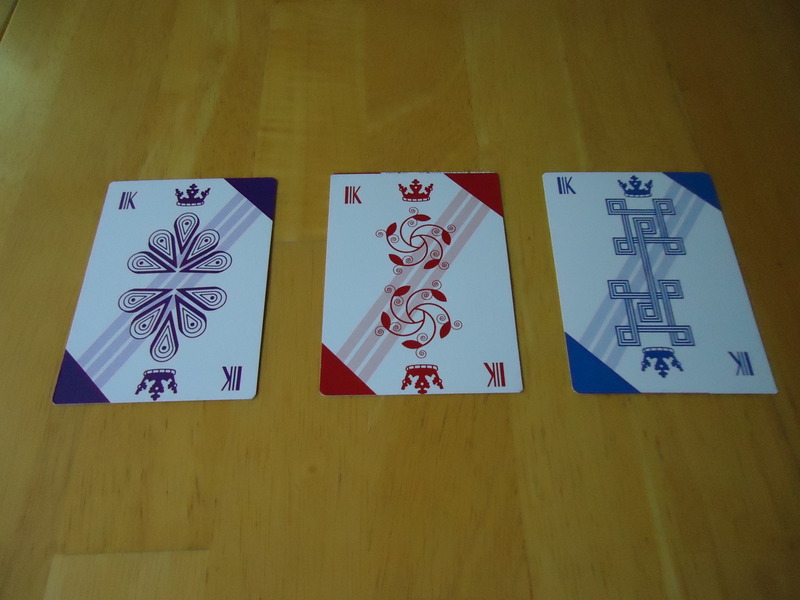 The Suit Card: Each card played on this row must be of the same suit as the others in the row, but they need not be in any specific numeric order. The central cards dictate how each row behaves. Three special cards can change the behavior of the rows. Aces are wild. If a King is played in a Plus Symbol row, the Plus Symbol flips to the Minus side and the row now behaves like a standard Minus row. If a Two is played in a Minus Symbol row, the Minus Symbol flips to the Plus side, and the row now behaves like a standard Plus row. After the fifth card is placed on a row, the player who controls that row adds up the total value. If the value is greater than 20 but less than 27, the row scores one point. Regardless of whether the rows scores or not, the cards are placed in the discard pile and the row starts over. The game ends when one player has three points. A Trifecta of Fun or A One Time Dud? At first glance, Trifecta doesn’t seem much different from other basic card games. Heck, it even uses the same suits as a standard deck of cards. What sets it apart, though, are two things: First, the presence of the special cards. The ability to change how a row behaves can seriously wreck whatever your opponent has been building. Just remember that it changes the behavior on both sides of the line, something I forgot once to my detriment. You might be messing up your opponent, but you might be messing up yourself, too. (Although sometimes you gotta do what you gotta do!) And the wild aces are just useful in all kinds of situations. Note that it will take a few plays to internalize the special card rules. In our first few games, we constantly forgot that the kings and twos changed the rows. As a result, a few of our “wins” were suspect. Once you play a few times, though, accounting for the special cards becomes second nature. The second thing that sets Trifecta apart from other card games is the ability to play cards on your opponents’ row. If you could only play to your row, this would be nothing more than multi-player solitaire. However, being able to dump your bad cards off on your opponent ups the interaction a bit. If it looks like he’s getting close to scoring, you can drop a low or high card on the row to either keep him from reaching 21 or push that row over 26, meaning he can’t score and has to start over. Of course, they can do it to you, too, so you have to watch out. There is just the right amount of thought required in this game to make it an ideal weeknight game, in my book. The hand size in this game is well thought out. You only have two cards, which both limits and provides options. With only two cards, you aren’t going to have a lot of options to sort through, unlike a game where you have a hand of five cards and all sorts of choices to make. But you are going to have some choices. Which card do you play now, and which do you hold back? Would you be better off just dumping your hand and starting over? Can you try to plan ahead and set up a cool combo? As interesting as the game is, there are a couple of potential negatives. First, there is no theme here. 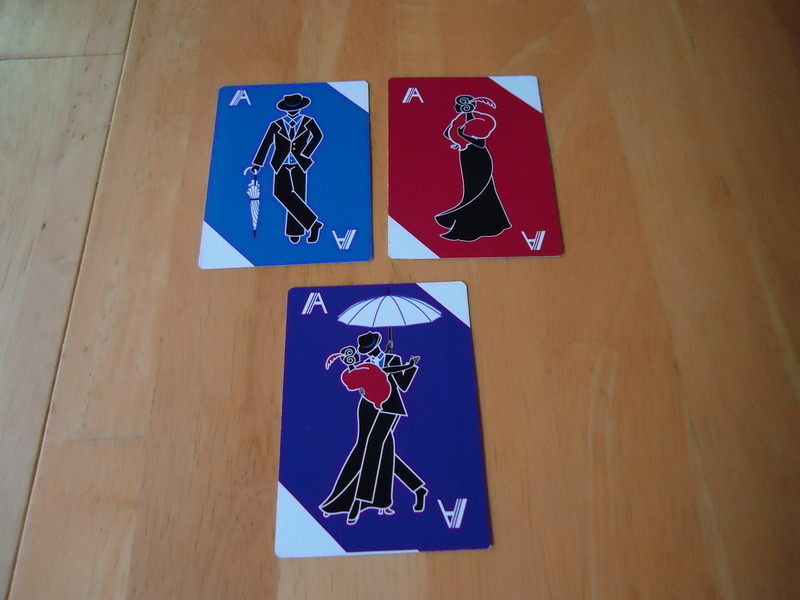 The cards are done in an Art Deco style and the art on the aces is particularly attractive, but this is really just a basic card game. It has no more theme than a game of poker or hearts. That’s not necessarily a bad thing, but if you’re hoping for an immersive experience you won’t find it here. Second, the game is two-player only. This is great if you plan to use it as a couple’s game, or as a game to play with a parent or friend who prefers standard card games. (I found it to be a great game to use with aging parents/older friends who like card games. Since Trifecta uses standard suits, it’s easy for them to understand.) However, it’s not ideal to bring to a game night because, even if played as a filler, only two are going to be able to play. Think about who you’ll play this game with and decide if it would see enough table time to warrant a purchase. Finally, there is the issue of time. Trifecta is supposed to be a fast moving game, playing in twenty minutes or so. You’re really supposed to make a cursory survey of your options and then make your move. It’s not entirely a speed game, but it should be played a bit like it is. The problem is that those prone to AP may try to think through every mutation of their options, looking at the cards they have figuring out what might be done with the left over card on a future turn, what might be done if they should get a certain card on the next turn, and what might be done if their opponent makes a certain move. While this may lead to victory, it will also anger your opponent. There isn’t enough game here to support overthinking it. While you’re thinking through every option, your opponent is getting restless and flipping TV channels because there’s nothing for them to do but sit at the table and fidget. There’s really nothing to look at, plan for, or play with. This isn’t a fault of the game, so much, as it is a cautionary tale to be careful when choosing your opponents. I played this with my math-obsessed husband and it took forever. The calculator in his head would not shut off and our second game took an hour. After that, I got out the sand timer from another game, an idea I highly recommend if playing with someone who wants to overthink this game. If you’re playing with someone who takes Trifecta for what it is and plays it quickly (or you put the slowpoke on a timer), it’s a fun and fast little game. Trifecta is a simple game with some interesting decisions to make. If you’re looking for a lot of theme or swanky components, look elsewhere. But if you’re looking for something for a couple that provides a decent amount of mental stimulation without being overwhelming, or for someone who likes standard card games, Trifecta could be a game for you. We’ll be keeping it in the collection for those nights when we want a game, but not too much game. Compact size makes it ideal to carry in a pocket or purse. Great for people who favor traditional card games. Not a bad way for kids to work on math skills. Decent amount of decisions to make without being overwhelming. Math-obsessed people and those prone to AP may slow things down. Gamers will lament the lack of deep strategy. Only two players, so not fit for larger gatherings. No theme, just an Art Deco redo of a standard deck of cards.